High quality Tanacetum parthenium tincture. Soil Association organic certification GB5. This item is in stock and ready for dispatch. 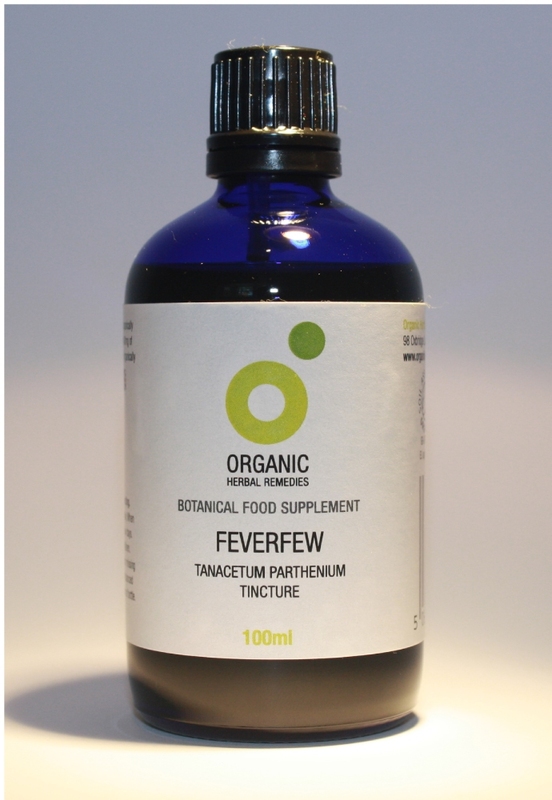 We use the same high tincture specification required by many professional herbalists. The tincture strength is high with a ratio of herb to pure grain alcohol of 1:3. 1ml is the equivalent of 333mg of herb. We use alcohol as this is the most effective method to extract the synergistic benefits of the whole herb. Suggested intake 1ml to 3ml three times a day. Chiden 6 -12 years old 0.4ml to 1ml three times a day. Some people prefer to take our tinctures with fruit juice or other flavoured drinks. Do not take Feverfew if pregnant. Seek advice if breast feeding. UK post is usually dispatched by the end of the following working day after the order is placed by Royal Mail first class.